The Calmar Ratio was authored by Terry W. Young in 1991. The higher the Calmar Ratio the better the instrument’s performance. The Calmar Ratio is the annual return divided by the maximum peak to trough negative return. Select linear bars only. 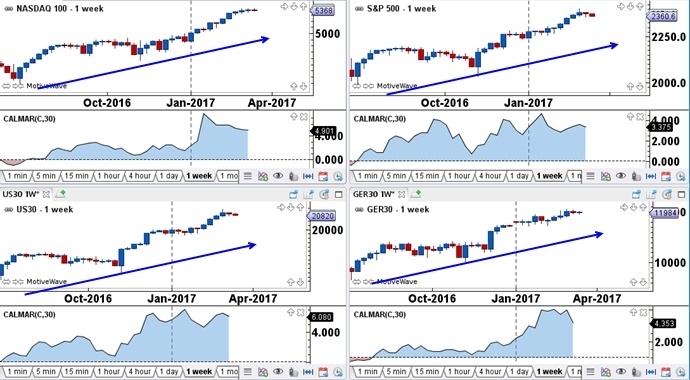 The chart above depicts four weekly CFD stock indices: NASDAQ 100, S&P 500, DOW, and DAX. A quick view of the Calmar Ratio below the price chart clearly identifies a bullish market since the histogram is blue. The higher the Calmar Ratio, the better the investment performed on a risk-adjusted basis over the specified time period; the lower the Calmar Ratio, the worse the instrument performed. The Calmar Ratio was originally designed for Managed Accounts, such as commodity trading advisors and hedge funds. In fact, Calmar is short for California Managed Account Reports, and very similar to the MAR Ratio. Typically, the Calmar Ratio is based on more recent data so investors get a bird’s eye view as to the risk of their investments during the current period identified. In this article, we are using the last 30 weeks as a measure of comparison. However, many analysts look at a three-year time period, if the data is available. This ratio can be used to compare any tradable instruments but in this article, I’ve compared four indices as well as eight stocks, four that are performing well, and four that aren’t, based on the Calmar Ratio. The Calmar Ratio is one of many statistics to measure return vs. risk and when looking to invest money in a fund, the investor can include this measure as part of their due diligence. We are taking a slightly different twist on the Calmar Ratio as you will see in the next section, but first, a few comments on the chart above. Of the four indices, the Dow has performed the best according to the Calmar Ratio, as it has the highest ratio of 6.10. The corresponding Calmar Ratios of the NASDAQ, S&P, and DAX are 4.94, 3.44, and 4.40. This means that during this recent bull phase, the downside risk was the lowest for the Dow, followed by NASDAQ, DAX and S&P. The returns of these four indices since election week in the US are18% for the NASDAQ and S&P, and 21% for the DOW and DAX. As a trader, I’m going to put on my trader’s hat to analyze the Calmar Ratio and provide tips for using it. 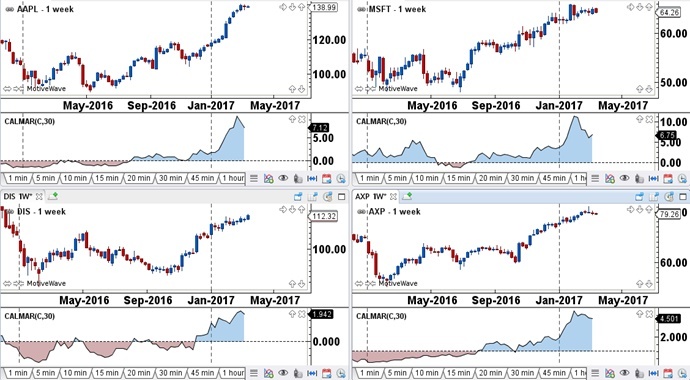 Example 1: In the example above, we see four trending stocks: AAPL, MSFT, DIS and AXP. A cursory look at the Calmar Ratio shows that it is currently in blue territory above the zero line for these stocks. Prior to these stocks turning bullish, the Calmar Ratio was below the zero line as a red histogram. When using this indicator, it therefore makes sense to only be in long positions when the Calmar Ratio is above the zero line. One can use basic technical analysis to enter a long position when the signal turns positive. It also pays to stay out of the stock when the Calmar Ratio is red below the zero line. Of the four stocks, Apple and Microsoft have the highest Calmar Ratio at 7.12 and 6.75, whereas Disney and American Express show 1.94 and 4.5 respectively. This implies that the top two stocks performed better on a risk-adjusted basis than the bottom two stocks. Example 2: In the chart below, I have selected poor performing stocks as per the Calmar Ratio. All four of the stocks are either trending down or trading sideways and the Calmar Ratio illustrates that. Intrexon Corp. (XON) and Abercrombie & Fitch Co. (ANF) are trending down and the Calmar Ratio has been below the zero line and red for more than a year. Neither of these stocks were prime buy candidates as per the Calmar Ratio. 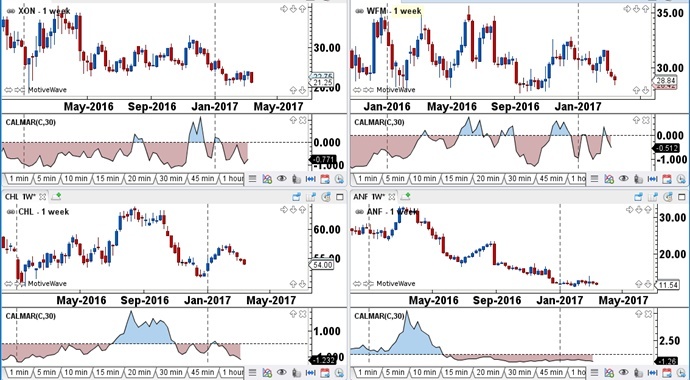 Similarly, Whole Foods Market, Inc. (WFM) and China Mobile Limited (CML) have been trading sideways which is indicative of the Calmar Ratio chopping above and below the zero line for over two years. Neither of these stocks were buyable according to the Calmar Ratio when compared to other healthier performing stocks. Learn how the Calmar Ratio helps confirm bullish markets and weeds out bearish or sideways markets. Start incorporating the Calmar Ratio into your chart set-up. Finally, use the Calmar Ratio in developing trading strategies. See you next week for another “C” indicator! This entry was posted in Trading Tips and tagged Calmar Ratio, Calmar Ratio for Stocks, indicators, market analysis, stock market, stocks.